Sources tell us that Eataly will open its first Canadian food concept in Toronto, likely in the city’s Yorkville area. Steph Chiu has written this analytical piece about Eataly and how it will affect local food retail if it opens in Yorkville. Pusateri’s Fine Foods (57 Yorkville Avenue), the Bloor Street Market (Manulife Centre, 55 Bloor Street West) or Whole Foods Market (Hazelton Lanes, 87 Avenue Road) for all their grocery needs. However, consumers will soon have a fourth option to choose from: Eataly, a new Italian food concept coming in the near future to the Yorkville district. Eataly is an Italian food market that first opened in Turin, Italy in 2007. Eataly was founded on Oscar Farinetti’s desire to combine elements of a lively, open environment with a learning centre to create a unique atmosphere where anyone could shop, taste, and learn about high-quality Italian foods. Eataly goes beyond the traditional shopping experience and offers more than your average fine grocery retailer. Inspired by the European food-hall concept, its massive stores are populated with tasting areas and gourmet restaurants to complement the upscale food offerings. The intention is for customers to taste the artisan products, learn about them from educated staff, and then buy the ingredients to recreate Eataly’s restaurant food at home, at fair prices. Not only do Eataly stores have dedicated departments for nearly every category of food imaginable (including unique departments like Chicago’s Nutella bar), they also offer a variety of unique classes that range from cooking lessons to wine tastings. because it ran out of food. Crowds continue to populate both stores daily, eager for a taste of the unparalleled gastronomic experience. If the success of these two stores is any indication, Eataly’s arrival in Toronto will likely be just as well-received. As we mentioned above, Eataly’s entrance into the Yorkville district will put it in direct competition with Pusateri’s and Whole Foods (and to a lesser extent the Bloor Street Market and local Rabba grocery outlets). But how do they compare to Eataly ? Pusateri’s Fine Foods is a Toronto-based family business known for leading the revolution in fine foods in Toronto, opening its first store in 1986 on Avenue Road. Its stores offer an extensive selection of products from around the world, including their renowned olive oil bar, and are designed to resemble a European marketplace in ambiance. There are currently three Pusateri’s locations in Toronto: Avenue Road, Yorkville, and Bayview Village. Whole Foods Market is a well-known chain of grocery stores that originated in Austin, Texas in 1980. Whole Foods is a purveyor of fine natural and organic foods and has strict quality standards for the foods it allows to be sold in its stores (for example, Whole Foods does not sell anything containing ingredients named on its “Unacceptable Ingredients for Food” list). The store design resembles a standard grocery store environment, but with a higher-quality selection. The chain expanded to Canada in 2002. There are now 371 locations worldwide, with stores in the United States (355), Canada (8), and the United Kingdom (8). Whole Foods expects to open another 40 Canadian stores in the coming years. In comparing the two grocery stores to Eataly’s store concept, it would appear that Eataly has the edge with its comprehensive value proposition. While all three are very comparable in product quality and variety, neither Pusateri’s nor Whole Foods have added services like restaurants and classes, and the atmosphere inside an Eataly store is undeniably unique. Consumers will no doubt be intrigued by what Eataly has to offer. We are very excited for Eataly’s imminent arrival in Toronto, which we predict will cause quite a disturbance in the growing luxury grocery scene. Although further details cannot yet be released, stay tuned for more updates on this developing story and to find out exactly when and where it will be located. The specialty food industry in Canada has been growing rapidly in the last decade, with 7.5% growth from 2012 to 2013 according to Stats Canada , making it the fastest-growing segment in food and beverage retail. Although the definition of 'specialty food' varies considerably, from "anything that is above average in quality or price" to "products that exemplify quality and innovation...often made by small manufacturers, artisans, and entrepreneurs," it is clear that this is a distinct and emerging segment of the grocery industry. 2012 report by Agriculture and Agri-Food Canada outlined consumer trends in healthy, natural, and unique products, driven by increasing ethnic diversity, as key reasons for the growth in specialty foods. Specifically in the gourmet and artisan food space, demand continues to grow as consumers become more affluent as well as interested and informed about their food choices. "Eataly", "Pusateri's", "Steph Chiu", "Toronto", "Whole Foods"
Roots has just announced that it will open a flagship store in the former Gap Kids retail space at 80 Bloor Street West in Toronto. Roots will be about 6,500 square feet and is scheduled to open in May, 2014. Despite receiving a press release discussing three Roots flagships, we've created this separate article for its new Bloor Street store since we were initially informed that Roots had leased the considerably smaller retail space across the street at 89 Bloor Street West (and not at 80 Bloor, as we now know). We're not sure if Roots plans on opening a concept in the space or if it even intends on opening there, at all. Holt Renfrew will replace Roots' 100 Bloor Street location with a 15,000+ square foot men's store. Roots' lease at 80 Bloor Street West will only last for a few years, however. 80 Bloor's owner plans to eventually demolish the entire building, replacing it with about 37,000 square feet of retail space below a tall residential tower. is the exclusive listing/leasing broker for 20 Edward Street, currently the World’s Biggest Bookstore. The store is scheduled to close at the end of March, 2014.
, with multi‐level patio opportunities, soaring ceiling heights, column free space, and common ‘back of house’ elements, this new restaurant row will offer exceptional dining spaces. The entire site boasts 250 feet of frontage along Edward Street. Each of the four restaurants will have numerous eye catching signage and branding opportunities to pull in the millions of yearly patrons from the many office buildings, stores, hotels, universities, theatre and entertainment offerings Yonge and Dundas has to offer. “We are really excited to work on this project and know that being steps from Toronto’s busiest intersection the site will attract the best ‘New to Market’ operators along with established Canadian brands and international chefs and concepts. 20 Edward Street will be Toronto's ultimate restaurant destination” says Jordan Karp, Vice‐President,Retail Advisory Services and lead for Paracom on the project. will open flagship stores only a short walk south. Yet another Downtown Toronto retail mall? "Paracom Realty", "Toronto", "World's Biggest Bookstore"
J. Crew has opened a 6,500 square foot store at Toronto's 110 Bloor Street West, and it is reportedly the first in Canada to extensively carry the company's more expensive and fashion-forward 'J. Crew Collection'. The Collection features pieces that are considered to be 'more complex' than the regular-priced, somewhat conservative J. Crew line. J. Crew and neighbouring Brooks Brothers have replaced retail spaces formerly occupied by Guerlain as well as a 13,000 square foot Escada store. Guerlain moved to a neighbouring retail space at 110 Bloor, while Escada moved to a substantially smaller space (3,656 square feet) at 131 Bloor Street West, aka 'The Colonnade'. Holt Renfrew has leased the corner retail location at 100 Bloor Street West in Toronto, and it has confirmed by Twitter that it will open a men's store on the site. The space's former leaseholder was Roots Canada. Few details are known about the new men's store which will compete with menswear retailer Harry Rosen , who's flagship store is directly across the street. We were first notified that Holt Renfrew was in negotiations for the 100 Bloor Street West retail space on January 13th. Immediately after, brokers and insiders began emailing us, asking for details on a new 'menswear concept' that they had heard would be opening in the former Roots space. Some speculated that Holt Renfrew's men's store would exit its 50 Bloor Street West flagship entirely so that it could relocate to 100 Bloor Street West. Not knowing details of the men's store and realizing the space is substantially too small for an entire Holt Renfrew men's store, we held off reporting on it until now, after the Globe & Mail revealed its research that a Holt Renfrew men's store will open in the space. According to lease plans provided by 100 Bloor's landlord, the former Roots space is in excess of 15,000 square feet. The Globe & Mail reports that the adjacent Body Shop store will also close as Holt's will occupy both retail spaces. Given the relatively small size of this retail space compared to the size of its flagship men's store, we're not sure exactly what Holt Renfrew has planned for the space. For size comparisons, Holt Renfrew's Vancouver men's store is about 25,000 square feet. Its Calgary men's store is just over 19,000 square feet, while its Yorkdale men's store spans 18,000 square feet. Contemplating these sizes and also noting that Holt Renfrew plans to expand the size of its Bloor Street flagship, we were left scratching our heads wondering what Holt's has in store for the former Roots space. We had suspected that the space could be devoted to the company's new unisex 'Holts Commons' concept, noting that Holts Commons had opened in a 7,000 square foot space at Holt Renfrew's Yorkdale store. At the same time, we doubted that the substantial rents for this prime Bloor Street corner location would be appropriate for the mid-priced Holts Commons concept. Menswear retailer Harry Rosen's 55,000 square foot flagship store is directly across Bellair Street from this new Holt's men's store. Harry Rosen will continue to be a very strong competitor. Its flagship carries some of the world's top menswear designers and features shops-in-store for such luxury labels as Tom Ford and Giorgio Armani Black Label. It will be interesting to see what Holt Renfrew will attempt with a space less than a third the size of Harry Rosen. .We'll keep you updated on Holt Renfrew's new menswear concept on Bloor Street, as well as its renovation and expansion plans for its 50 Bloor Street West flagship store. "Harry Rosen", "Holt Renfrew", "Toronto"
Popular American womenswear retailer Chico's intends to open Canadian stores as part of its international expansion. Its first Canadian store locations will be in the Toronto area, according to Women's Wear Daily. Chico’s was founded in 1983 in Florida. It sells private-branded clothing and accessories for women "featuring a combination of great style with on-trend, expressive and one-of-a-kind designs to yield a wardrobe that is fashionable, unique, relaxed, figure-flattering, and comfortable," according to a description on its parent company's website. Chico’s currently operates more than 600 stores and over 100 outlets across the U.S., the District of Columbia and Puerto Rico. Chico's is a division of Chico's FAS, which has already opened White House | Black Market stores in Canada including three in the Toronto area. Both Chico's and White House | Black Market are expected to further expand into Canada. Besides White House | Black Market and its Chico's women's stores, Chico's FAS operates Soma Intimates and Boston Proper. "Chico's", "Toronto", "White House Black Market"
Suitsupply has announced that it will open its first Canadian store location on February 20th, 2014. We previously reported that the Dutch menswear retailer had leased space at 9-11 Hazelton Avenue in Toronto. According to its press release, the store will occupy about 4,800 square feet. Suitsupply is a vertically-integrated men's suit retailer that was started in 2000 in Amsterdam. It has received many awards and was voted #1 men's suit retailer by the Wall Street Journal. Prices start at around $400 and both quality and style are considered to be exceptional. Suitsupply is known for choosing 'unconventional' retail locations. Its Chicago store, which opened over a year ago, is located on the top floor of a former Barney's New York store and features a penthouse roof garden. As a size comparison, Chicago's Suitsupply store is reportedly about 5,500 square feet. Suitsupply has 10 American store locations and it expects to have three more American stores within a few months, according to its website. "Toronto isn't just Canada's largest city," says Suitsupply founder and CEO, Fokke de Jong. "It's also one of the world's style capitals — a vibrant and diverse city. Our decision to expand into this market was from the demand of our Canadian clients. We wanted to give them a store in the Toronto community and we're proud that we can deliver what they've been asking us for." The company's press release also states: "Suitsupply's newest outpost is housed inside a converted mansion on Hazelton Avenue in the upscale neighbourhood of Yorkville. Brimming with Suitsupply's signature eye-catching photography and bold colour, the 4,800-square-foot space is the perfect backdrop for the label's tailoring-driven collection; impeccably tailored suits and sportcoats made from the finest fabrics from top Italian mills such as Larusmiani and Vitale Barberis Canonico. Warm, welcoming and brimming with energy, Suitsupply is the perfect environment for the gentleman who is looking to feel relaxed while trying on a suit or sportcoat. Better yet, if something doesn't fit perfectly items can be altered to sartorial perfection on-site at the tailoring bar, which, as with all Suitsupply boutiques, is located front and center. The shop also features Suitsupply's ever-expanding collection of sportswear, shoes, and other accessories. Of course, this being Canada, there's plenty of warm outerwear on hand too." Sources say that Vancouver-based Mountain Equipment Coop (MEC) may build a new flagship store in Downtown Toronto. The store would replace a 28,000 square foot surface parking lot at the corner of Queen Street West and Soho Street in the heart of the city's popular Queen West shopping area. The location of this surface parking lot is unusual. It has remained vacant for years despite its prime location in the centre of one of Toronto's busiest and most popular shopping districts. Most stores in the immediate area are of a smaller size compared to the expected size of the MEC store. Its recently announced North York store will be 44,000 square feet, for example. Buzz Buzz Home reports that MEC will locate its Toronto flagship store at the base of a new building on the site that will include commercial offices above and underground parking below. MEC already has a Downtown Toronto store a few blocks south on King Street West. We received an update that this building has not been sold, nor has it been listed for sale. A source told us that its building was sold to a Toronto-based real estate developer, and we have been updated that this was incorrect. We'll update you when we learn more about this interesting retail and real estate development. Thank you to source: pw20 of Urban Toronto, who posted this Buzzbuzzhome.com article. Mountain Equipment Coop (MEC) is one step closer to opening a 44,000 square foot store at 784 Sheppard Street East in suburban Toronto. North York Community Council* has supported a rezoning application that will go to vote at Toronto City Council on February 19th. If built, this will be Toronto's second MEC store. For those unfamiliar, MEC is a Vancouver-based consumers' cooperative which carries outdoor recreation gear and clothing and sells merchandise exclusively to its members. A lifetime membership costs $5, and the company has over 3.5 million members. It is considered to be Canada's largest supplier of outdoor equipment. It was founded in 1971 and has 17 stores in 16 Canadian cities. The two-level MEC store would be part of a mixed-use development that would also feature 50 units of stacked townhouses behind the new store, on the north portion of the 0.786 hectare site. Parking would be provided underground through two separate garages that are connected by a common access ramp. The store garage would hold 125 car stalls; another 93 would be available for residents of the townhomes. Vehicle access to the site would be provided from Sheppard Avenue. Thirty-six bike parking stalls are also proposed for the store. 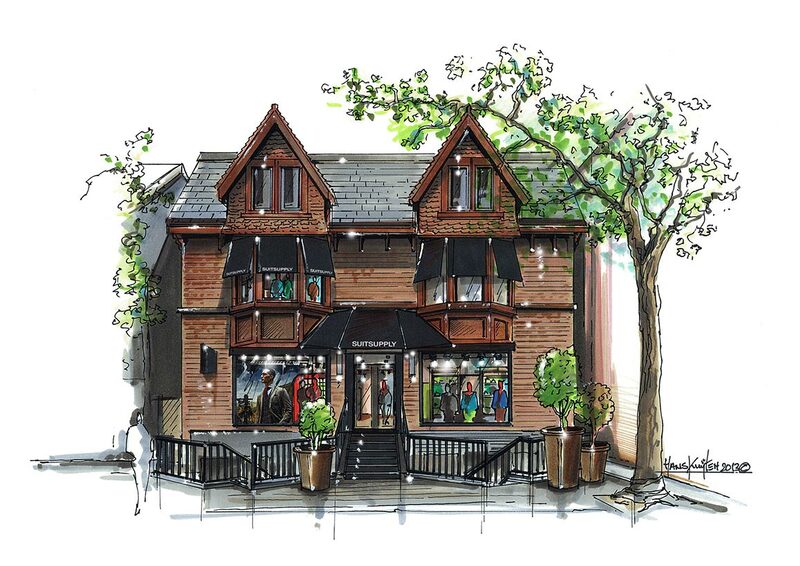 If approved, construction of MEC’s North York store and the townhouses will begin in March. The store is expected to open in the spring of 2015. It would be MEC’s second store in the Greater Toronto Area, complementing the retailer’s downtown location on King Street West. "We are extremely pleased to have received the support of North York Municipal Council," said MEC CFO Sandy Treagus. "MEC firmly believes that our proposal aligns with the city’s planning objectives for the site, and we are optimistic that Toronto City Council will also see its merit and approve the rezoning." * Thank you, Skeezix, for noting our previous error of referring to 'North York Community Council' as 'North York Municipal Council'.